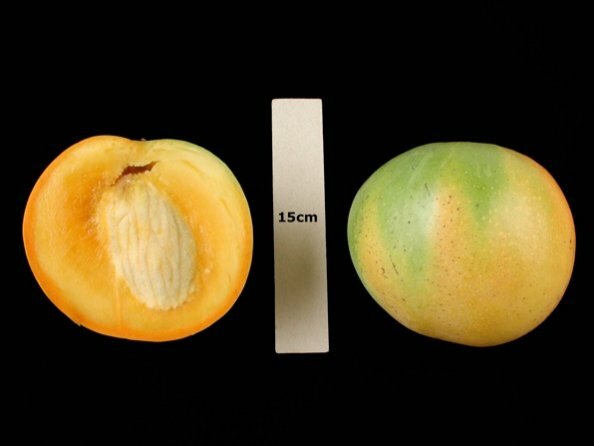 &QUOT;CUSHMAN&QUOT; IS AN EXCELLENT MID TO LATE SEASON MANGO THAT RESEMBLES A GRAPEFRUIT IN SIZE, SHAPE, AND COLOR. THE FLESH IS SMOOTH, CREAMY, AND COMPLETELY FIBERLESS. ALTHOUGH THE TREE IS NOT THE MOST AESTHETICALLY PLEASING DUE TO POOR DISEASE RESISTANCE, ONE BITE WILL MAKE YOU DROP THE AXE. FOUR TO SIX KOCIDE APPLICATIONS A YEAR WILL MAKE IT A LITTLE EASIER ON THE EYES. THE FRUIT RIPENS JULY TO AUGUST.